How Will Chavez Handle Defeat? The panic set in around 7 p.m. Sunday evening, when the news arrived from inside Venezuela's National Election Commission (CNE), which is dominated by allies of President Hugo Chávez. 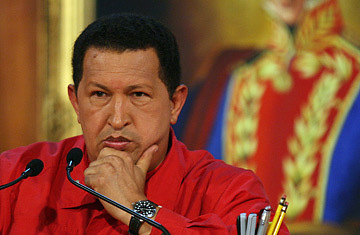 Referendum returns indicated that Chávez's constitutional reforms, including the elimination of presidential term limits, would narrowly lose. Inside the Miraflores presidential palace in Caracas, Chávez  who had yet to lose an election since winning the presidency in 1998  was visibly upset. Still, according to government sources, he soon checked his anger and insisted the tally would turn his way before the CNE announced the results at 10 pm. But aides knew better: one slipped into his office and began calling newspapers, asking contacts at each one to secretly hold off printing victory op-ed articles that Chávez officials had written, and the full-page ads the government had bought that hailed the triumph of his "21st-century socialism." At 10 p.m., Chávez was still losing by less than 2 percentage points. But the CNE, seemingly overwhelmed by the close contest, delayed its announcement while Chávez waited for the margin to drop below 1%, at which point he'd seek a recount (as Al Gore did in Florida in 2000, he said later). But the margin barely budged, and the opposition started seething in the streets, fearing fraud. Around midnight, Chávez's ex-defense minister, Raul Baduel, who opposed the reforms, warned that Chávez was flirting with popular unrest. By 1 a.m., says a government insider, Vice President Jorge Rodriguez  a respected former CNE director who had guided the transparent presidential recall referendum that Chávez defeated in 2004  helped convince el comandante that conceding was "the only alternative left" and that he shouldn't wait any longer. Chávez's calm concession did Venezuela, as well as democracy-challenged Latin America, a valuable service. And, whether he believes it or not, Venezuela did Chávez a favor as well by rebuffing the constitutional amendments that sought to expand and extend his already ample political power. The referendum loss should prod him to focus on the Venezuelan problems that need to be fixed before he leaves office in 2013, instead of the globe-trotting socialist and anti-U.S. crusades he hoped to pursue as President "until 2050," as he remarked last month. If so, he stands a better chance of leaving a solid legacy as the revolutionary who finally set Venezuela and Latin America on a real course to solve the worst inequality of any region in the world  and not as just another overweening Latin leftist who stayed too long. "We support Chávez's social project," says Ismael Garcia, a socialist congressman who rejected the reforms. "But he has to realize that people who disagree with him aren't necessarily 'enemies of the people.'" Chávez insisted in a TIME interview last year that "capitalism is the way of the devil." But while Chávez, who controls the hemisphere's largest crude reserves, has used his awesome oil windfalls to reduce poverty, Venezuelans now suggest they want to increase capitalist investment, satanic as it may be, to solve their nagging unemployment. They appreciate his shrewd efforts to raise oil prices, but they'd also like him to lower inflation, Latin America's highest. And while they admire him for enfranchising the majority poor, they'd applaud as loudly if he did something to reduce their nightmarish crime. (Caracas on many weekends sees more than 50 murders.) Says Juan Mejia, 21, a leader of the student movement that galvanized opposition to the reforms, "Chávez can expect violent crime to be the reason for our next massive march  and he should march with us." But it would be ill-advised for Chávez to try to revive the idea of nixing presidential term limits, as he hinted this week he may do. (The Venezuela vote may also give other Latin American countries  especially Colombia, Bolivia and Ecuador  second thoughts about giving their own Presidents more if not unlimited terms.) Unlimited reelection was arguably the proposal that repelled voters most, and to ignore that reality would only invite trouble. Instead, says Bart Jones, author of a new Chávez biography, !Hugo!, it's time for Chávez and chavistas "to stop thinking about the Bolivarian Revolution as a one-man show and start cultivating other leaders." Alberto Barrera, co-author of another biography, Hugo Chávez, agrees: "Chavistas have unfortunately reached that ideological point where they can't even imagine any other President." If so, however, they risk leaving chavismo  and in turn Venezuela's poor  politically orphaned in the 2012 election against a more conservative opposition. Sunday's vote has already sparked speculation about who might be Chavez's successor in that race, as well as whether a rejuvenated but usually fractious and incompetent opposition might finally field a viable candidate. Aside from perhaps Rodriguez, pundits can think of few if any chavista potentials. Opponents, meanwhile, could include erstwhile Chávez allies like Garcia, who because they defected over the reforms may have a crossover appeal sorely lacking in Venezuelan politics right now. But that's five years away. Chávez can best influence that race by making sure the vital ideals of social justice that got him elected in 1998 aren't discredited by the political polarization and economic uncertainty that got him stung on Sunday. Most of the student protesters interviewed by TIME this week, for example, express support for Chávez's basic agenda: "There's no doubt he brought necessary changes to a very corrupt Venezuela," says Mejia. And the leftward, less U.S.-dependent turn he engineered in Latin American politics has ironically made the a more market-oriented model he professes to disdain more viable in countries like Brazil by making it more egalitarian. Sunday's humbling results will make Chávez a less swaggering figure on the hemispheric scene; but a little humility on his part may make his neighbors more receptive to initiatives like the Banco del Sur, or Bank of the South, meant to counterbalance traditional, U.S.-backed lending institutions like the World Bank. In fact, it was Chávez's electrifying emergence a decade ago that paved the way for the election in this decade of other, albeit more moderate leftist heads of state like Brazil's Luiz Inacio Lula da Silva, Argentina's Nestor Kirchner and Chile's Michelle Bachelet. Venezuelans may be reminding Chávez that, like his revolution's namesake, 19th-century independence hero Simon Bolivar, he stands to have a positive place secured in Latin America history. Their message on Sunday: Don't blow it.